They say it is a myth that in life, happiness can be found by writing a book, and planting a tree. They say politics is the expression of the people. They say innocence is lost in childhood. They say green is not blue, and that the oceans are red. They say hope is not a valuable commodity worth having in modern society. They say that the loud story will always cover the silent story, however, others believe that both stories do "echo in the infinity of human existence." In Thailand, the people love their King. However this does not seem to apply to the Prime Minister of Thailand. The Red Shirts, the mayor opposition group, took forward a symbolic demonstration yesterday, March 17, 2010. Their goal? To paint with blood the walls of the house of the Prime Minister. Our source says; "The Red Shirts support deposed Billionaire Thaksin Shinawatra who did billion Baht deals with the Burmese Generals." The information published by the international media agree with this statement. The Red Shirts are not the same group as the Yellow Shirts. The Yellow Shirts where responsible for shutting down the airport of Bangkok in December, 2008. According to onground sources, "Yellow shirts are supporters of the present Government. Yellow is worn on Mondays in Thailand as a sign of respect to the King and Royal Family." In fact Monday is Yellow shirt days. Yesterday, thousands of men, and women, dressed in red, filled the streets. Trucks drove by filled to the top in red. Marchers walked past security forces and police. Noisy and intimidating, yet not violent. It is believed that the blood spilled on the walls is supposed to act as curse, to bring an end to the government of the Prime Minister of Thailand. However, it is unlikely that their action will have this immediate effect. The streets of Bangkok which are unique to the eye, every once and again, lately more often than never, become the arena of the political agora of the people's expression. Numerous Red Shirts activists, covered their faces with red clothing. The image was one of power demonstration of the opposition, and of a shocking blood spilling expression. The Sun Maker was covering Thailand, specifically, Thailand Environment and Foundations in Thailand working with environmental education, when the streets of Bangkok, shifted the focus. As we observed the Red Shirts, take the streets to protest, we paused. The contrast between the Bangkok of politics, the Thailand of advertising, the breathtaking environmental Thailand, and the Thailand which is seems to escape our knowing, turned us idle. The Kingdom of Thailand, which turns cryptic, when the Red Shirts speak load, became the motivation. 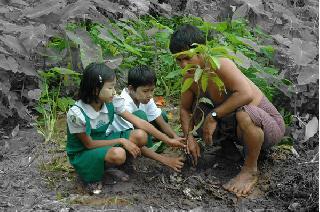 The image of two young children, in the rural areas, being taught how to plant trees, became the inspiration. In realization that it is, in these confusing times, just as necessary to cover the silent story as it is to cover the "big" story we decided to cover the story of Souls Foundation. A dreamscape image story, not filled with blood, nor making blood less relevant. A story of young children, girls and boys, throughout Thailand, Cambodia and Vietnam who are engaged in trees and the environment. In the midst of the "eternal sea" of politics, which constantly takes hold of the attention of the media, we found the silent tree, a small tree, where the earth had an unique smell and the hands drew the water, where the laughter of innocence not lost still reins in the garden of South East Asia, and in the Kingdom of Thailand. Souls Foundation declares their mission online. They say they are here to; "To broaden the horizons, enhance the futures and provide a new vision for children living in poverty around the world, through health care and the gift of the Arts." Soul Foundation hosted the first ever Tree-Planting Event in Cambodia for the Shelter CCPCR, in joint collaboration with the Cambodian Center for the Protection of Children's Rights. In their most anthropological words they state; "Cultivating crops and trees remains a central part of life in Cambodian, particularly in the countryside. Prior to the event, the children learned about the environment, the trees planted, upkeep and agricultural techniques, and also about human harmony with nature." In Burma, Souls Foundation sponsored the planting of 10 mango trees at an orphanage/school in the delta region. (Image above) Cyclone nargis killed 130.000 burmese in 2008. Many of the children helped with the planting and learned about sustainable development. Working not only in tree planting events, but assisting and providing aid to tsunami victims, medical care for Burmese refuges, and working education for the future generations of South East Asia, they now dream with the possibility to expand their altruist dream into further international frontiers. Souls Foundation is part of KingstonCorp.com companies. The story says that cofounders and long-time friends, Dave Kingston and Dean Armstrong came up with the idea during a holiday in Thailand, back in the year 2004. Kingston companies vary from properties, to condominiums, media groups, sports bar, trucking companies, agriculture, thermo power plants and sea foods. Location of these enterprises are of global interest. Among these companies, Souls Foundation work stands out, as a of hope. Kingston website claims that in discussions "on the island of Phuket just days before it was hit by the Asia Tsunami, the devastation that followed strengthened their resolve to develop the (Souls) foundation." Souls Foundation makes use of education and art specially aimed to what they say, "to change the lives of children in the moment and most importantly in the future." Embedded in the local communities, they work with every level of society. Believers of self thinking and critical thoughts they state; "We offer children a new vision of the future by encouraging them to think independently and critically, explore their individuality and enhance their communities in ways that challenge conventional approaches to education." While "the drive behind" Souls Foundation comes from Kingstoncorp, the truth is that it is the local children who are engaged in Souls Foundation Project of Tree Planting, and environmental awareness. Whether by aiding in times of emergency, creating health facilities for refugees, education by art or tree planting events, Souls Foundation is still filled with life, and emerging strongly with new ideas. It is likely we will hear from them again. With the same patience the young boys and girls have, when waiting for their small tree to grow, we await for the new tomorrow. We await for the messages of South East Asia and for the billion of silent Trees´ Souls to continue to grow under the Sun. As Mahatma Ghandi said, "You must be the change you want to see in the world."